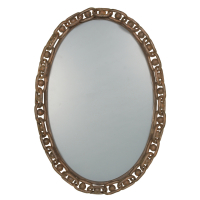 Oil Rubbed bronze finished metal mirror features interlocking metal chain motif. Oval cross bar on back with 2 hooks for easy hanging. Made in China. 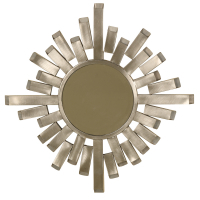 This wall hanging mirror features a gun metal silver finish with a sunburst decorative design. Eye hook on back for easy hanging. Made in China. 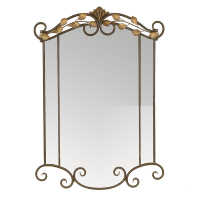 Beautiful wall mirror has a silver finish. 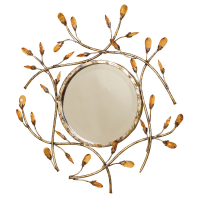 Mirror is framed with scrolling branches with clear faceted acrylic gems as the buds. Hook on back for easy hanging. 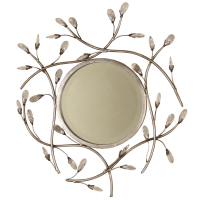 This two tone metal mirror will add elegance to any part of your house. 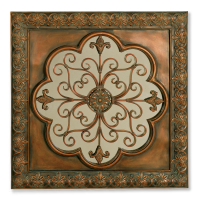 Oil rubbed bronze finished is complimented by a dusted gold leaf inserts. Hooks on back for easy hanging. Made in China. 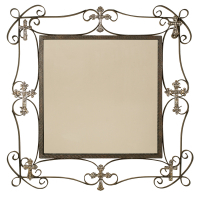 Square wall mount mirror in an oil rubbed bronze finish featuring aged gold cross accents. Hook on back for easy hanging. Made in China. 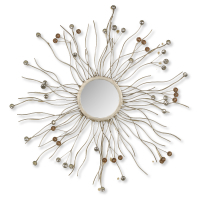 Sunburst silver metal wall mirror. Bursts are adorned with silver and gold jewels. Hook on back for easy hanging Made in China. 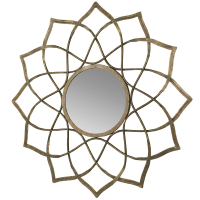 Scrolled oil rubbed bronze metal swirled mirror with hooks on back for easy hanging. Made in China. 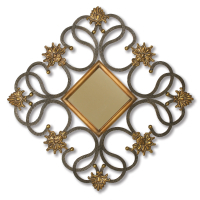 Black scrolled iron wall hanging mirror is adorned with antiqued gold fleur de lis designs and a mirror encased in gold. Hooks on back for easy hanging. Made in China. 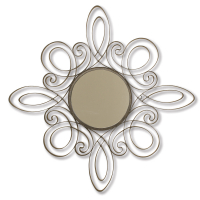 Stainless steel metal works wall hanging mirror. Features bent metal open ended spokes from center mirror. Hook on back. Made in China. 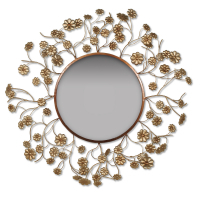 Enclosed with acanthus leaves our floral insert is backed with a mirror. Finished in an aged copper. Hooks on back for easy hanging. Aged gold metal frame with lively gold metal stems and flowers extending from center. Hooks on back for easy hanging. Made in China. 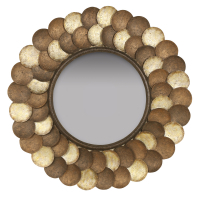 This large brown and soft gold capiz shell wall mirror will make a statement in any room. Hooks on back for easy hanging. Dust with a dry cloth. Made in China.